John Butcher's music ranges through free improvisation, composition, multitracked saxophone pieces and work with live electronics, amplification and feedback. 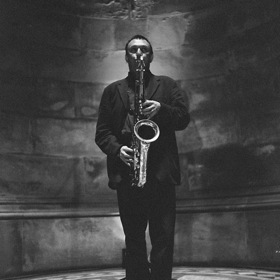 He is well known as a solo performer, recently exploiting extreme acoustics, and has composed pieces for Chris Burn's Ensemble, Polwechsel, the Elision Ensemble and the Rova Saxophone Quartet. He started playing the saxophone whilst studying physics, but, after finishing a doctorate on quantum chromodynamics he left academia in 1982 and went off with music - working with Burn, John Russell, Phil Durrant, Paul Lovens and Radu Malfatti. In the early '90s he joined what became the final version of John Stevens' Spontaneous Music Ensemble and also began playing with Derek Bailey and Phil Minton. Electronic music was an early influence on his approach to saxophone playing, and became explicit in his electromanipulation duo with Durrant, and, more recently, in duos with Christof Kurzmann and Toshimaru Nakamura. Some current projects include Thermal with EX guitarist Andy Moor & Thomas Lehn, The Contest of Pleasures with Axel Doerner and Xavier Charles, and duos with Steve Beresford, Gerry Hemingway, Rhodri Davies, Paal Nilssen-Love, Gino Robair, John Edwards and Eddie Prevost. Butcher continues to play in many occasional, sometimes just one- off encounters - ranging from large groups such as Butch Morris' London Skyscraper, Radu Malfatti's Orkestra and the EX Orkestra, to duo concerts with Fred Frith, Akio Suzuki, and Otomo Yoshihide.